The 1952 Mother’s Cookies Baseball Card Set consists of 64 cards of players from the Pacific Coast League. The Mother’s Cookies set is one of the most popular regional minor league sets ever produced. Distributed exclusively distributed on the West Coast, the cards are extremely scarce. The 1952 Mother's Cookies cards measure 2-13/16” x 3-1/2” and have rounded corners. The cards feature color photos on a color background, along with the player name and team. 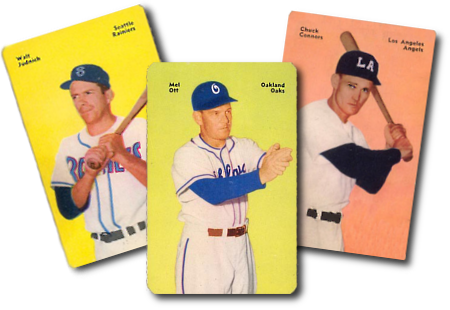 Card #4 of actor Chuck Connors is the most popular, while card numbers 11, 16, 29, 37, and 43 are the most rare. CLICK HERE if you want to sell your 1952 Mother's Cookies Baseball Cards.